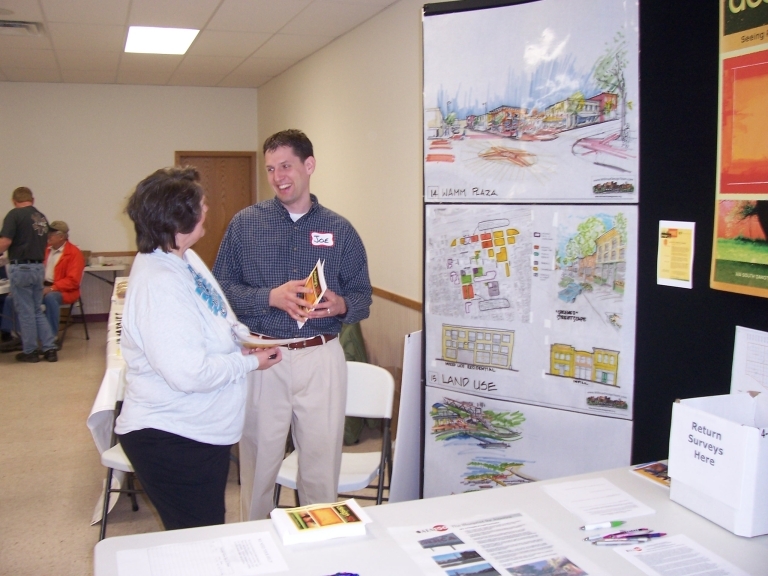 The fine folks in Deuel County, SD have invited the design:SD team for a visit. We’ve been dicussing holding a charrette in Deuel for a couple months now, and this “pre-visit” will help us in making that decision. All-in-all, nine d:SD team members made the trek on July 8. Led by our official tour guide, d:SD founding team member Jim Beddow, we visited a few sites in and around Gary, SD and then headed toward Clear Lake to visit that town and a City park at it’s nearby namesake. See more photos from the trip here. 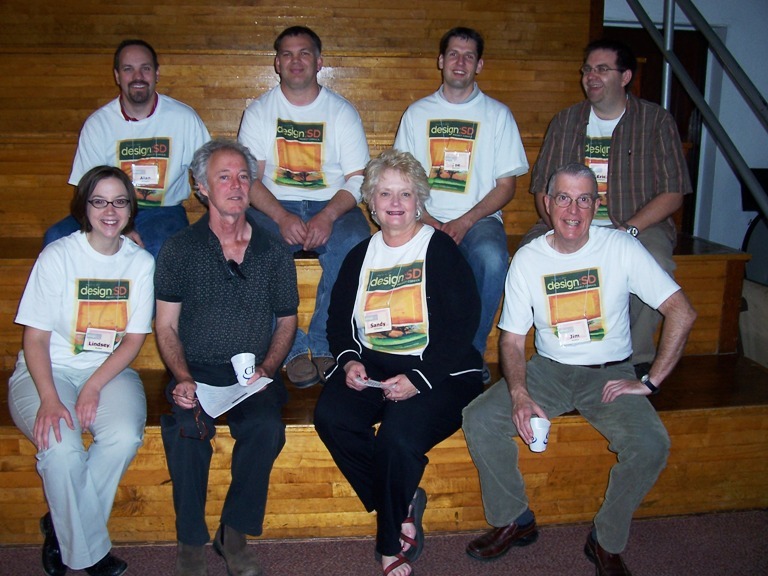 The “Original” d:SD Team (pictured l to r, back row first): Alan Wieskamp, Scott Anderson, Joe Bartmann, Eric Ambroson, Lindsey Karlson, Tom Reasoner, Sandy Dickenson and Jim Beddow. Not pictured: Mike Knutson, Terry Aaker and John Deppe. We have a lot of sweat equity into these boards. Eleven team members spent two and a half days (and much of a couple nights) learning, sketching, designing and illustrating ideas and options for the future based on the many visions of the folks in the Corsica region. Lots of local people put in tons of time and effort too. It was truly a mixing bowl, and an experience many of us will not forget. We’ll laminate the boards and put together a summary document for the Corsica community. We’ll be sure to get the edited copies of the presentation video (thanks Evan) to the community too. Today we’re taking a deep dive into part 2 in Corsica. Tonight the team (now 13 people strong!) will gather at the Corsica Legion Hall with host families and local volunteers for some get-to-know-each-other time and an orientation to what lies ahead for them during this three-day journey. Tomorrow morning, the intensity level gets kicked up a few notches as we begin the “Learning Studio,” followed by the “Design Studio” on Friday and the Community Presentation on Saturday morning (click here to see the schedule). 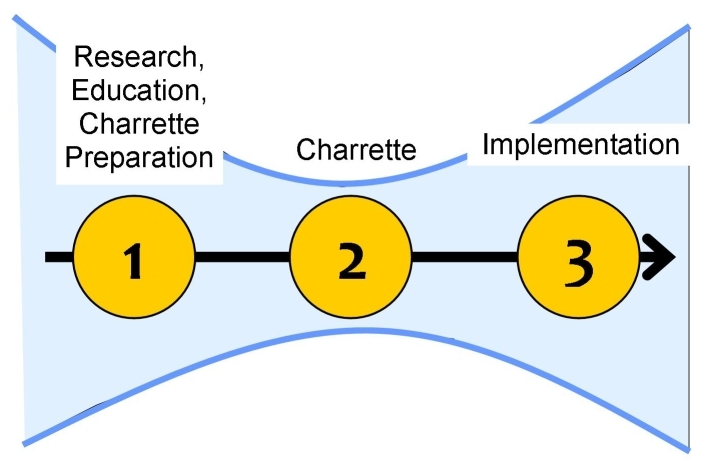 The Charrette (today through Saturday) is what we’ve been fussing about and anticipating for months, but it’s really just one part. Organizers and volunteers have poured big effort and countless time into getting Project Corsica ready to roll. We’ll also spend a lot of time on Stage 3 after the Design Team leaves on Saturday. Here is the latest schedule for the Thursday (May 17) Learning Studio portion of the design:SD charrette in Corsica. Since Corsica will become the first ever design: SD community, the CHS Senior English class is using this unique opportunity to be involved in something that matters to their community, while meeting academic standards. By participating in this kind of real world education, CHS seniors discover first hand how important research, writing, and communication skills are to the success of this project. The seniors are responsible for creating survey questions and for collecting data that will be important to the design team in helping the community create its vision. Collecting data through survey questions and discussion, attending design team and community meetings along with photographing various points of interest around Corsica are just a few ways CHS seniors are contributing to this project. Meeting deadlines, utilizing technology, and working with a wide variety of professional people is a great way to experience the real world while giving helping their community. To help gather community input the CHS seniors have created an online survey. To give your ideas and input to the design team please click here. The preliminary results of the survey will be reported by the students at the “Dessert and Design” gathering on Tuesday, April 24th at 7:00pm in the Corsica grade school gym. Tuesday, April 24th will mark the official local kickoff for design:SD, Project Corsica. Please join members of the South Dakota design team for an evening of “Dessert and Design” from 7:00 to 8:30pm on April 24th in the Corsica grade school gym. The evening gathering begins the three week countdown to the design:SD event that will be held May 16-19. Dessert and coffee will be served while the design team describes the project and what it means for the Corsica region. 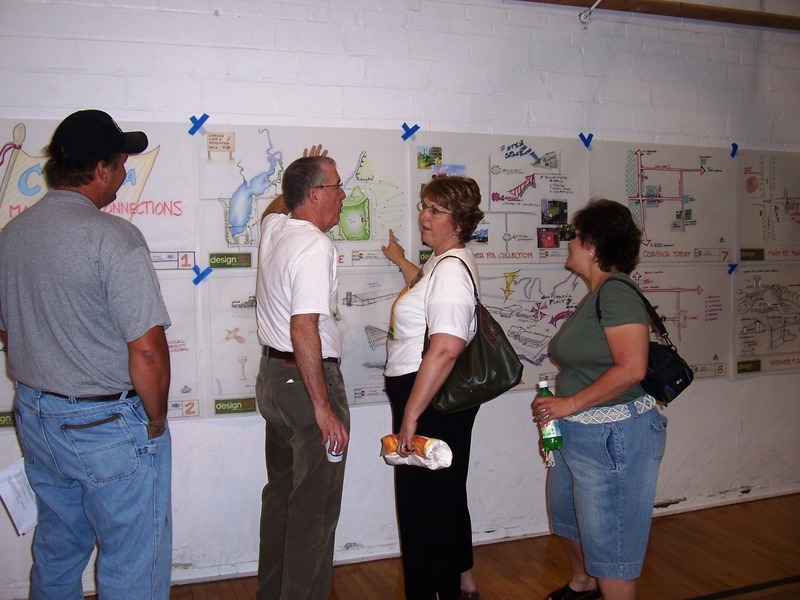 Area residents will discuss what ideas and dreams they have for the future of the Corsica region. Those ideas will help create the foundation of the design team’s visit in May. Corsica and the surrounding region is the first-ever design:SD project community. The event will draw 20-30 professionals from all walks of design and community development to the region to visually express local dreams for the future. 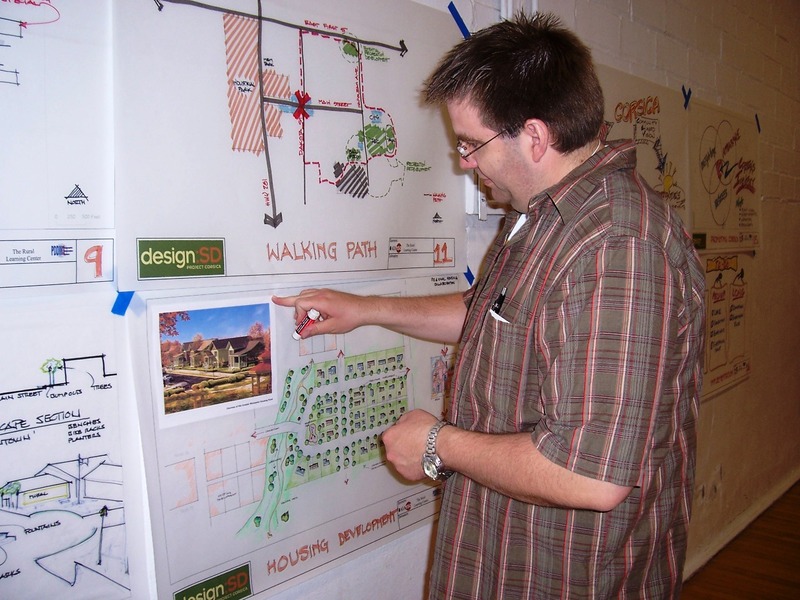 The design team will spend three intense days in the area learning, listening, and drawing what locals want the community and region to look like in years to come. The design event will help people of the Corsica region dream about the future, with special emphasis on the importance of design in building a vision we can all share. The success of design:SD, Project Corsica relies on your involvement in the process. Please join members of the design team on Tuesday, April 24th to learn more about becoming involved in this special event. To view the flyer, click here. 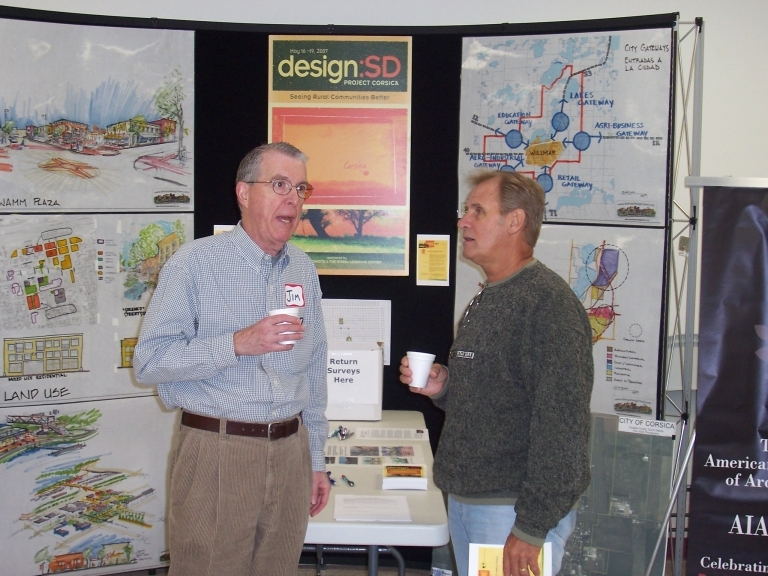 The Design South Dakota team introduced the project to many Corsica area residents at the Corsica Commercial Club’s Customer Appreciation Days last Saturday. The Commercial Club served pancakes and sausages for free to hundreds of Corsica locals, while Jim Beddow, Ward Whitwam and I talked design and charrette with the locals. 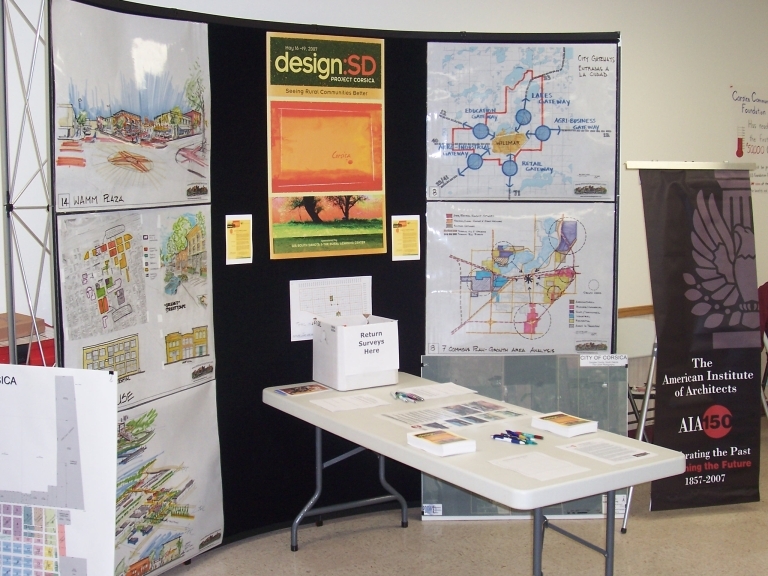 Big thanks go to our friends at the Willmar Design Center in Willmar, MN (especially Bev Daugherty) for allowing us to borrow their charrette boards to use in our display. Also thanks to TSP Architects in Sioux Falls for lending us the display background, to Bobbi Gaukel at one8ty creative for designing the logo and handouts on super short notice, and to Nathan Hinker and the Corsica Commercial Club for inviting us to participate (and giving us the idea for the booth)! Ward Whitwam, AIA and a member of the design:SD planning team, ran into an old friend (or maybe adversary?) at the pancake feed. Ward designed the Corsica Elementary School 39 years ago. 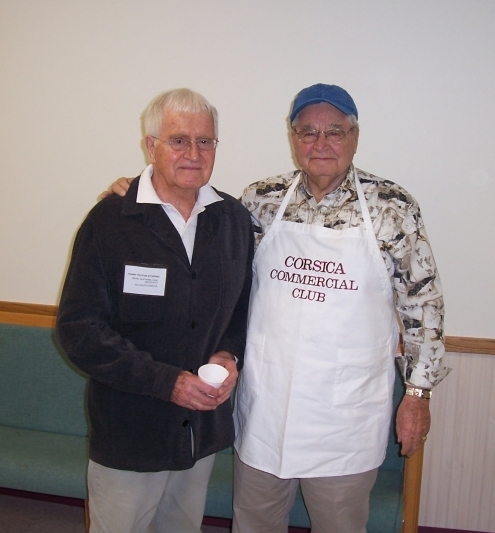 At that time, Sid Hoekstra, who still lives in Corsica, was the School Board Chair. Sid and Ward recalled the arguments they had almost 40 years ago over the price of the project. Ward also visited with the folks in the Douglas County Hospital booth. He learned they will be celebrating the 50th anniversary of building the hospital later this year. As it turns out, Ward also designed that building half a century ago! Thanks to the Corsica community for the warm welcome!